According the the national Honeybee Conservancy’s most recent statistics, 21 percent of managed bee colonies in the United States did not survive the 2016-2017 winter. Beekeepers can’t control the weather or temperatures, but there are steps they can take to increase the odds of overwintering their hives. Before the cold temperatures settle in, check to make sure the bees have enough food to get them through the winter. A rule of thumb is between 40 and 50 pounds of stored honey per hive. Most beekeepers stop collecting honey from their bees in late summer, allowing the bees to store and keep what they produce for their winter food. Using one-inch styrofoam insulation, cover the hives’ top and sides taking care not to block the hive’s entrance. It’s also very important that the hives are properly ventilated during the winter to prevent a build up of dampness inside that can result in fatal bee hypothermia. 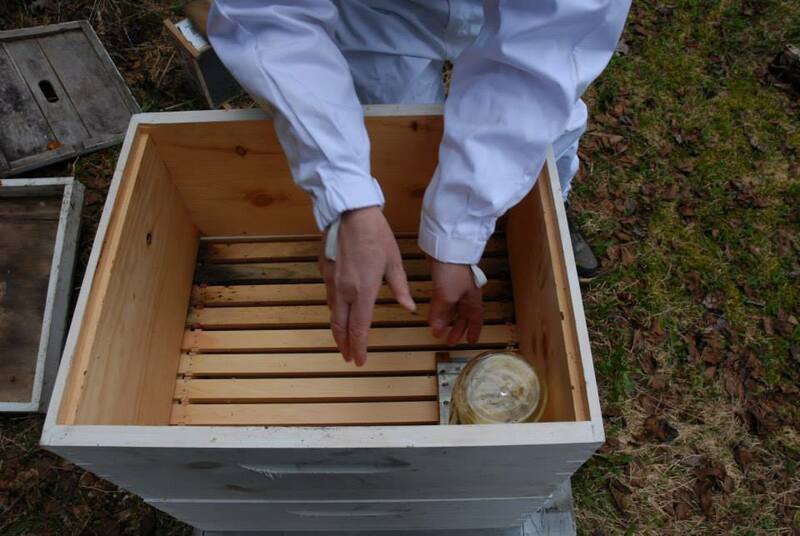 Leaving the entrance open, and using hives with screened bottoms will provide the necessary ventilation. In regions that receive significant snowfalls, it’s important to clear away any snow or ice from the hives’ entrances on a regular basis. If the bees have not stored enough honey for the winter and they run out, beekeepers will need to feed their bees until the spring pollen production begins. 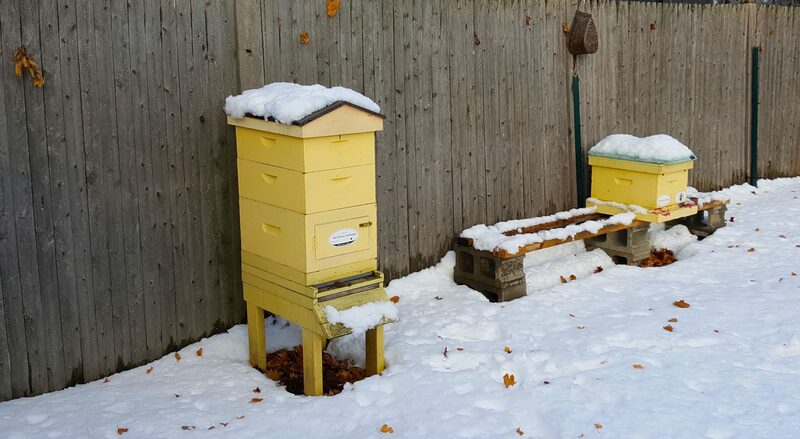 Using a hive-top feeder is the easiest way to feed bees in the winter. At its simplest, the feeder is a small platform on which a mason jar filled with a simple sugar syrup is placed. Place the feeder inside an empty super on top of the hive and top with an insulated cover. The bees will come out of their frames to feed on the sugar syrup, which should be a mixture of two parts sugar to one part water. A super is the box in which frames are hung for the bees to use to create combs to store honey. What are the bees in winter doing? Inside the hive the worker bees have one important job — keeping their queen warm and fed throughout the winter. When the temperatures drop to below 55 degrees, the worker bees will begin to cluster around their queen, using vibration of their wings to give off body heat and create a cozy 90-degree space for her. All winter the worker bees rotate from the inner portion of the cluster to the much colder outer edges. When the bees in the colder outer edge become so chilled they are motionless, they are gently “pushed” by the warmer, more active bees, into the center to warm up. Do bees come out in the winter? On sunny days when the temperatures rise above freezing, it’s common to see worker bees outside the hive and doing a bit of housekeeping. Taking advantage of the relative outside warmth, the bees will drag out any corpses of dead bees and, perhaps more importantly, answer their own calls of nature after being cooped up for days or even weeks on end. Bees will not defecate in the hive if they can help it, so it’s not uncommon on these sunny days to see the white snow around a winter hive “peppered” with tiny dark blobs of bee poop. Every region is different, so it’s a good idea to check with local beekeepers since the best overwintering strategies will differ from one climate zone to the next. But with a little preplanning and attention to detail throughout the winter, there’s a very good chance your hives will be alive and ready to go with the return of warm weather.